The promotion, description and only considered interpretation of Darwinius masillae as "The Link" to (humans) the group of the haplorhine primates, caused an intense debate, especially by various online communities. Nearly one year after the announcement and the criticisms, the authors of the discovery have published a response in which they address the claims: GINGERICH et al. 2010. According to the response, the list of characteristics that confirms the phylogenetic position of Ida didn’t change, especially considering only the modern representatives of the primates. However the actual statements do not address the dispute of the comparison of the traits of Ida to the fossil representatives of the haplorhine. Many features of modern haplorhine are not shared by fossil specimens’ of the group, so the “unique” features that pose Ida in relation to modern haplorhine, at the same time do remove it from to fossil ones. It is possible that the observed characteristics, used to reconstruct the position of Ida on the phylogenetic tree by FRANZEN et al. 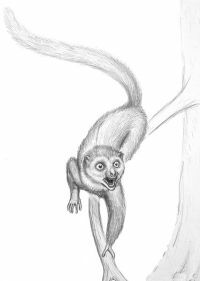 2009, are misinterpreted examples of homologies inherited by a common ancestor of haplorhine and strepsirrhine primates, or analogies evolved in both groups by convergent evolution.